Fly to Seychelles and Johannesburg at once - Multi city flights from €470! Air Canada non-stop flights from Shannon, Ireland to Toronto from €259! Cheap return flights from London Heathrow to Denpasar Bali for £352 (€395)! 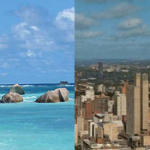 Fly to Seychelles and Johannesburg at once – Multi city flights from €470! How about to fly to Seychelles, tropical heaven on Earth? Just imagine you relax at one of the stunning sand beaches drinking your favourite cocktail or discoveingr diversity of this exotic island? How about to also discover Johannesburg, the largest and the most important city of South Africa? (also considered to be world´s largest city not situated on river, lake or coastline). How about to fly to both sides at once?..Multi-city flights from Brussels o Seychelles and Johannesburg at once returning to Paris are now available already for €470! Deal is based on 5* Etihad Airways and their partner Air Seychelles. This is again based on service of Etihad Airways and their currently updated tariff. Look for flights in travel period in November 2017 then February to beginning of June 2018. Blackout period around Easter Holidays. Thanks to this promotion you can book multi city flights from Europe to Mahe, Seychelles and Johannesburg, RSA at once for this incredible price. Please note that its not possible to reverse the flights (you can not firstly flight to RSA and then to Seychelles). Need an accommodation in Mahe, Seychelles or Johannesburg, South Africa you can use service of Agoda, Hotels.com, or Booking.com. Below you can refer to our booking and few travel date samples. 13.11. – 22.11. – 29.11. 13.2. – 21.2. – 7.3. 27.2. – 7.3. – 14.3. 6.3. – 14.3. – 21.3. 23.4. – 2.5. – 9.5. 5.5. – 16.5. – 25.5. 7.5. – 16.5. – 23.5. 12.5. – 23.5. – 30.5. 22.5. – 30.5. – 6.6. 5.6. – 13.6. – 17.6. Booking sample of a multi city flight to Seychelles and South Africa for €470 below. In this case you would be departing on 7th of May from Brussels to Mahe, then from Mahe to Johannesburg on 16th of May. Your return flight from South Africa to Europe would be on 30th of May 2018.